It''s easy to learn because in this game, there are no right or wrong answers! The game challenges you to imagine if a fellow player were a noun, for instance, or maybe placed in a certain situation. Players choose from one of six options provided below the question. 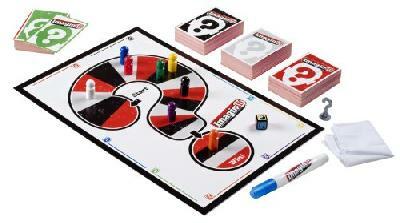 Choose the most popular answer and advance on the game board! Be the first player to reach the center and win! Includes 212 Imaginiff question cards, 64 coloured numbered voting cards, 52 Pick-a-Player cards, 8 pawns, 1 die, token, dry erase marker, game board, rules and more! Great game received in described condition and received in expected time frame. This is a fun game even in a group of people that don't know eachother that well. We just got this game over the weekend on clearance at a store and it was still more expensive than on Amazon! We played it with a group of 7 people that we're very close to, so it was hilarious! I'm not sure how it would be if in a group of people you don't know well. It was easy to learn and even with 7 players the game went moved along very quickly and we finished in about 20 minutes. I appreciate fast games, there's nothing more dragging than starting a game and still be going at it 2 hours later when e..